My love for picnic is well documented at Dessert By Candy. 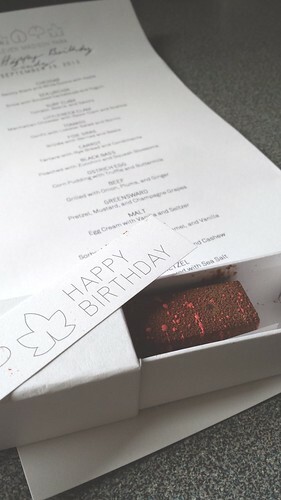 Last weekend, I was treated to the ultimate picnic on my birthday at New York’s revered Eleven Madison Park. No, the restaurant is not offering takeout for parkgoers next door. I will explain that in a bit. On that sunny afternoon, M and I experienced the full tasting menu combining the restaurant’s signature dishes, seasonal ingredients from the tri-state area, novel take on iconic New York bites, and classically prepared luxurious dishes. Our senses were wowed and entertained by the playful dishes. With equal amount of elegance and whimsy, we enjoyed one of my most memorable meals in recent years. Our lunch began with refreshing nibbles ranging from savoury aged cheddar apple black and white cookies to sea urchin snow with smoked cantaloupe. Late summer tomato featured prominently on the menu and the tomato course offered the first taste revelation that afternoon. One half of tomato confit was stuffed with lobster salad, croutons, smoky bonito, and fresh herbs. We were presented with two lobster claws on ice and filled with more lobster salad. However, it was the glass of tomato soda that made the biggest impact. The clear and pale green liquid looked simple but every sip of the bubbly elixir was pure essence of tomato. I was hooked. Dining as entertainment is not a new concept (hello Caesar salad!) and there were plenty of tableside preparation to drive that point home. A deconstructed Manhattan clam chowder came with a glass teapot of aromatic steeped broth. Two lightly cooked carrots were fed into a hand-crank meat grinder at our table before we dressed the tartare with a painter’s palette of condiments. Beef that was aged 140+ days was presented to us with fanfare before it returned to the kitchen to be grilled. Served with pickled plum, onion, ginger, amaranth, and jus thickened with marrow, the flavour was nuanced and to be savoured. Egg cream made with malt syrup, vanilla beans, olive oil, and seltzer was dexterously mixed in front of us before it made a two second trip to my lips. A card trick was played at dessert time to reveal two immaculate pieces of chocolate filled with the predicted flavours. I broke out in giggles many times by the sheer amount of playful surprises. However, the highlight of the meal was unquestionably the cheese course (for me, anyway). 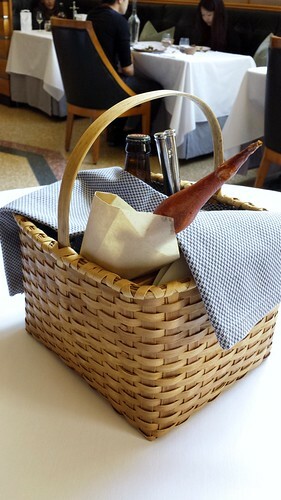 Our server set down a basket on our table and left us with the direction “you will find everything you need for your next course in this basket”. M and I removed the content one by one and it became apparent that we would have a mini indoor picnic. I grinned from ear to ear. 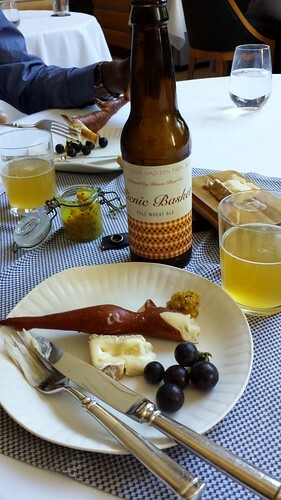 We meticulously spread the picnic blanket, trompe l’oeil “paper” plates, cutleries, glasses, and bottle opener between us. M opened the bottle of custom-brewed pale wheat ale and filled our glasses. I untied the leather-bound wooden box to reveal a piece of washed-rind Greenswald cheese (washed with said beer, of course). It was perfectly creamy with a runny centre. We topped our plates with warm pretzel, champagne grapes, and honey mustard. It was a blissful moment to share this most special experience with M.
Our meal was filled with culinary highs. Funny how it was a simple picnic that captured my heart.